Rex Chamberlain is a Senior Research Scientist and owner of Tetra Research, which he founded in 1995. He specializes in Loci/CHEM development, applications, and services to government and industry. What do you see are the biggest challenges facing CFD in the next three years? Rex: The integration of CAD and mesh generation has come a long way, but since grid generation is still very labor intensive, I am hopeful that the challenge of high quality, near push button hybrid volume meshing from a given surface mesh is not far off. For Loci/CHEM, at least, hybrid meshes work very well, essentially irrespective of the geometric complexity, but the goal of making the computer do the meshing work is still an obstacle in many instances. A current solver challenge that is being addressed consists of rearranging memory utilization and processor communication strategies that are based on distributed memory clusters and MPI to take full advantage of combined multi-core CPU and many-core GPU hardware integration strategies (e.g., linear system assembly on CPUs and linear system solution on GPUs). Since Loci is the logic engine that controls memory optimization and processor communication within the CHEM solver components, the implementation of such hybrid strategies in Loci will be transparent to the CHEM developer. Finally, as more complex flow problems are addressed, the need for more physical modeling naturally arises. But even the addition of a “little bit” of physics, such as adding water particles to a launch plume simulation, quickly snowballs into challenges of adding new sub-models for interactions between particle heating and evaporation as well as particle scattering due to atmospheric turbulence. Introducing just a little more realism into the simulation often makes the problem much harder to solve, and new insight into physical modeling will be needed as expectations for complex CFD simulations grow. John: Your thoughts on mesh generation cover three disparate topics. You mention CAD-mesh interoperability, the push-button dream, and “given surface mesh.” Can you go into a bit more detail on each of those about what the specific issues are? 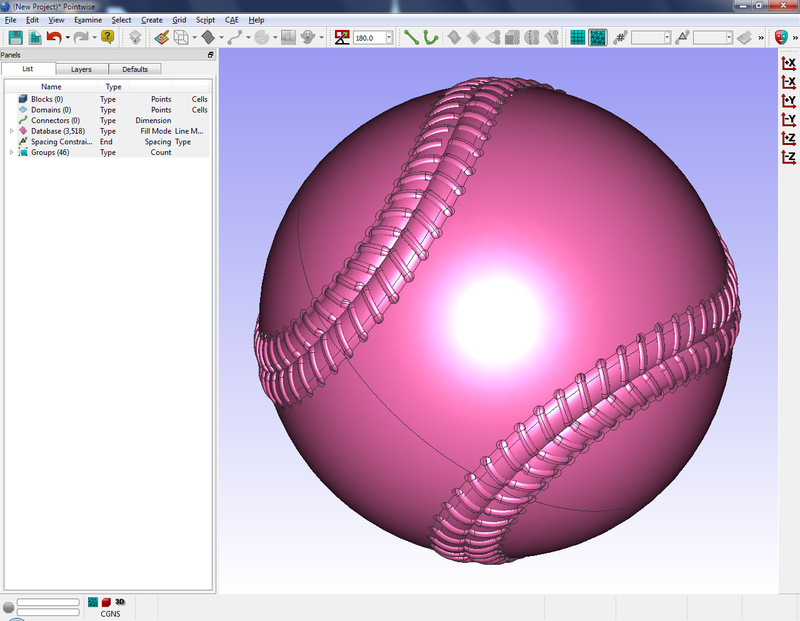 Figure 1: Detailed CAD model of a baseball. Rex: CAD-mesh interoperability depends to a large extent on the ultimate use for the CAD file. 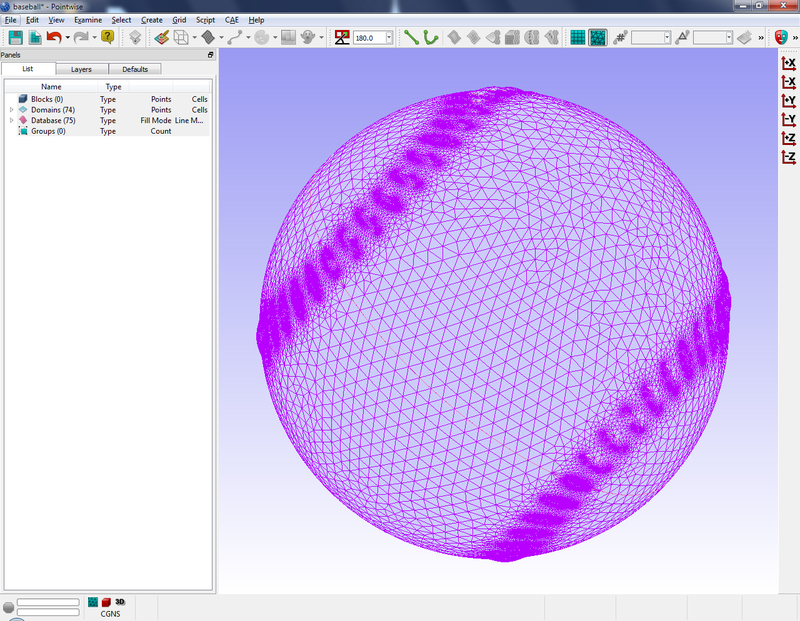 For example, some CAD models may be fine for producing a picture but are difficult to mesh, as in the case of a richly detailed baseball model (Figure 1). The model is immediately recognizable and contains quite precise interlacing of the stitching, but meshing was impossible (at least for me) due to model gaps and missing pieces of geometry that don’t matter for generating a shaded image but that are essential for a mesh. Even Pointwise’s solid modeling wouldn’t improve this situation, nor would I expect it to. Figure 2: Simplified baseball geometry was easier to mesh. 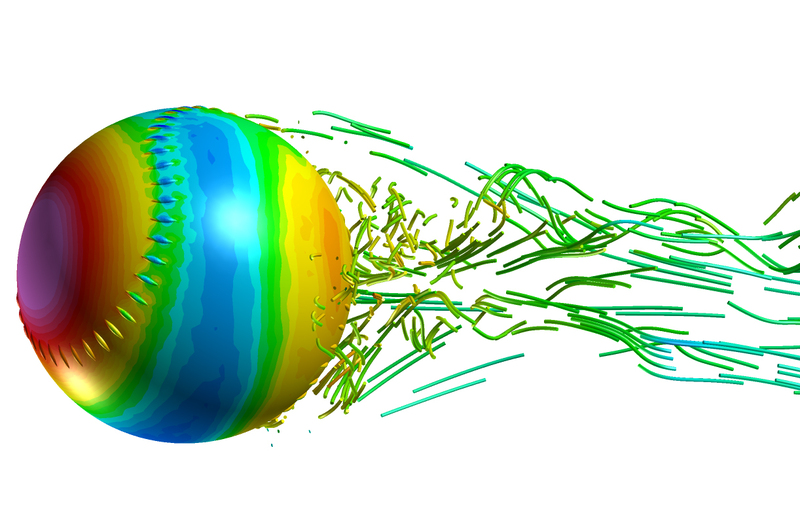 A simplified CAD model of a baseball (Figure 2) was much easier to deal with in Pointwise, and the result is still quite recognizable. In this case, I was able to create the model and mesh the surface quite easily, and I refer to this result as the “given surface mesh” because it is virtually given once you have a watertight surface model. Starting from this surface mesh and from a simple outer boundary, wouldn’t it be nice to fill the domain with T-Rex (anisotropic tetrahedral extrusion) cells blending nicely into tets with the same few clicks needed for generating the surface? It actually took a few more steps, mostly for setting appropriate T-Rex extrusion parameters. In the final mesh, the boundary layer anisotropic tets were converted to prisms for the flow solution (Figure 3). But since this is a curveball, the unstructured volume mesh around the ball is actually rotating (click here for video). I think this one was a called strike. Rex: I have two main projects with NASA, a Phase II and a Phase III STTR, both with Ed Luke at Mississippi State University. The Phase II deals with adding solid rocket ignition and mesh-following grain burnback models to Loci/CHEM. The idea is to be able to quantify the solid propellant ignition delay and then to capture the burning surface area and motor volume changes by recessing the propellant surface mesh according to the local burn rate. The Phase III deals with Lagrangian modeling of water spray interacting with a launch plume just after ignition and during early ascent from the pad. Physical modeling of the evaporating water droplets and their effect on pressure wave propagation are key elements of this research. The video shows evaporating water droplets interacting with a launch plume for a simplified motor (Figure 4). We have particle heating, evaporation, and breakup models in place, and we are working on adding atmospheric boundary layer and particle/turbulence interaction models to complete the simulation. Rex: I studied physics as an undergraduate at Denison University in Granville, OH, and then moved over to aerospace engineering for graduate work at the University of Illinois at Urbana-Champaign. My first job after graduation was teaching at the University of Alabama for three years, but I never really experienced hands-on engineering until moving to Huntsville to work for Lockheed in 1987. My close work with customers kept driving me to smaller firms until I was able to start Tetra Research and begin writing SBIR/STTR proposals. This work lead to an association with NASA Marshall Space Flight Center and ultimately Ed Luke, both of whom I still work with. Having learned to develop new CFD applications with Loci/CHEM has been extremely satisfying because I can focus on numerical modeling and rapid prototyping of innovative tools that integrate seamlessly into the existing code. The result is a powerful simulation suite that I am gratified to see is making an impact at NASA and increasingly within the aerospace industry. John: I’m interested in your thoughts on the relative merits of working for large and small companies. I went through a similar transition from a 30,000-employee company to a five-person company and then to my own company. Rex: The transition from a large company to a small business was a natural progression for me, but the end result was not at all anticipated at the outset. There are, of course, risks in both situations, but I have gladly accepted the challenges of owning a small business. Even though the pressure is on to create and innovate new products and services, there is a certain sense of satisfaction that comes from building the business and the lasting relationships that have contributed to my career. Although I work more or less alone, I could not have prospered by myself, and I owe a lot of my progress to the many customers and associates I have interacted with along the way. Rex: I started as many kids did back in the late sixties and early seventies with building and flying model rockets. I liked advanced math in high school but shied away from physics until college. After graduation, my decision not to study planetary sciences or to accept my commission in the U.S. Marine Corps, both viable options at the time, left me with no real prospects until my wife suggested that I should study what I loved: rockets. She had patiently watched so many Star Trek episodes with me that, of course, it was obvious I should pursue a career in space and rockets and not just dream about it. So I applied to the University of Illinois Aerospace Engineering Program in 1978 and luckily was accepted, even without an undergraduate engineering degree. I have been working with CFD, aerodynamics, and propulsion simulations ever since. John: Do you have any thoughts on what inspires kids to enter engineering (and eventually CFD) today? Rex: With so many different activities competing for kids’ time and attention, it is a wonder that there is motivation left for inspiration. I think that play time is a great way to innovate and discover and that taking time to explore provides an excellent path to inspiration for kids. Letting kids be kids is probably the best way that our technologically driven culture can let young, curious minds slow down long enough to find the personal interests that ultimately lead to a stronger sense of purpose, commitment, and self-satisfaction. And I’m sure the interests they find will include engineering and CFD. Rex: CFD is a great field, and it encompasses so many different disciplines: computer science, numerical analysis, mathematics, physics, and engineering, to name just a few. So you have to know your fluid mechanics and how and when to apply CFD, but don’t let just doing CFD and making pretty pictures be the end result. Learn the language of the people who use your CFD results and couch your analyses in their terms, not the arcane language of CFD. Yes, getting paid for doing something you love is a great reward, but make the necessity of your results more compelling by correlating predicted fluid dynamics to the component or system behavior that your customers care about. Pictures and animations carry a lot more weight when they relate to or explain behavior that goes beyond the fluid dynamics alone. Rex: I have known about Pointwise since the Gridgen days, and I have known many of the staff through attendance at conferences. We have also worked together on some projects, and of course, it makes a lot of sense for CFD folks to associate with mesh generation folks. If you ever have a chance to hang out with these types at a party, you’re sure to hear some great stories. John: That may be the first time I’ve ever heard mesh generation folks labeled as great party guests. Rex: The funsters who thought up the concept for the Laurel-and-Hardyesque “Another Fine Mesh” blog sound like they know how to have a good time. I use Fieldview (www.ilight.com) and Tecplot (www.tecplot.com) quite a bit for visualizing and extracting detailed flow information. 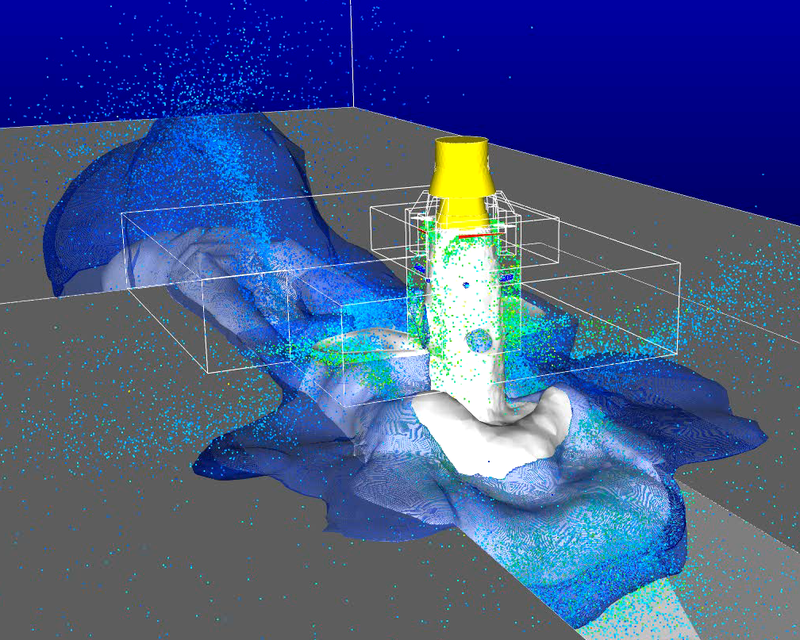 Visualization is essential to explaining how the fluid dynamics relates to engineering behavior. Other tools include the online version of CEA (Chemical Equilibrium with Applications, www.grc.nasa.gov/WWW/CEAWeb/) or the NIST web database (www.nist.gov), which are often useful for setting up or testing chemistry models. I sometimes use the Engineering Toolbox (www.engineeringtoolbox.com) for finding physical data or for especially weird unit conversions. And of course the DTIC and NASA Technical Reports Servers are always of great help. John: So what’s your opinion on the current unavailability of the NASA TRS system? Rex: The NASA TRS system is publicly unavailable at the present time due to recent concerns that it may contain material subject to U.S. export control laws and regulations. Although my work has required access to only a limited portion of the database, I have never found improper material there. My question is, if there are concerns now, why weren’t there concerns at the beginning? It should be simple enough to move the database to a secure server that is password protected to allow continued access (note: all NASA employees and contractors already have an agency userid that must be used to access the NASA Aeronautics and Space Database, for example). Rex: The best local restaurant is an Italian place called Verucchi’s. You would have to drive two hours to Chicago to even attempt to find anything more authentic and delicious. John: Not that I’m dismissing small town dining, but do you get to Chicago often for fine dining? Absolutely! We go up once or twice a month, especially in the summer. Small plates for many different types of cuisine are very popular now, much like Spanish tapas. Italian, Mexican, Japanese…you name it. The plates come out as soon as they are ready, so it’s always fresh and lots of fun because you never know what is coming next. I also hear the Girl and the Goat is excellent, and I finally got reservations for June. This entry was posted in Applications, People & Places, Software and tagged FIeldView, Loci/CHEM, Tecplot, Tetra Research. Bookmark the permalink.